Would your horse benefit from a Reiki treatment? The benefits of Reiki are just the same for animals as they are for humans. If we equate these to horse specific problems Reiki can help with spookiness, separation anxiety, depression, aggressiveness, box walking, weaving and wind sucking. Horses which are stabled in confined spaces for long period of time can develop stable vices which stem from being stressed, nervous and unhappy. The winter, when the paddock is waterlogged and use by horses would ruin the ground for the coming spring/summer months is an example of such lengthy periods of confinement. Horses are free roaming herd animals, and long periods of stabling without natural herd interaction and exercise can take its toll on the most laid back and calm of our equine friends. Horse owners manage these periods of confinement the best they can, but this can still fall short of a horse’s daily needs, and this is where Reiki can be a valuable tool for both horse and owner. Reiki is just as effective on our four-legged friends as it on anybody else. No matter their size, animals are very open to receiving Reiki’s relaxing energy. Horses are particularly sensitive to energy as the mechanics of the herd operate on energy from the most dominant of the herd to the lowest in the pecking order and so it makes sense that they are equally sensitive to Reiki energy. And just as with humans, animals can be treated hands on or hands off, so even those who can’t or won’t be handled because of aggressive tendencies or a nervous disposition can still be treated. Horses should be treated in their usual surroundings, they know where they are, and the only new thing introduced into their daily routine is the practitioner. For those who have separation issues, having a field mate close by can be beneficial. How does a horse react when being treated? Most horses will display a sleep like state, a lowering of the head, quivering of the lower lip, relaxing of the muscles and resting of the legs, all of which indicate a deep state of relaxation. However, those who have deep seated mental issues to come to terms with, can display quite severe shaking/tossing of the head. Reiki can help these poor souls to release their fears, frustration and/or anxiety, and at the end of a treatment are calm and relaxed. It’s beneficial if they can be put out in the paddock after a treatment, and it’s interesting to observe them in the paddock afterwards. Most horses seem a little dazed at first, standing in the paddock not quite sure of their surroundings, gently coming round to wander calmly away back into the herd. The first point of call is usually a source of water, and it’s important that they have free access to water after being treated as they will feel quite dehydrated. 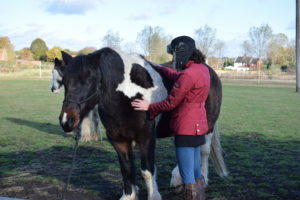 Reiki is also very beneficial for riders with a nervous disposition, and the use of horse and rider Reiki techniques can resolve many issues caused through the transference of nervous energy from rider to horse. The use of Reiki in the equine world is growing at a steady pace as owners/riders look for alternative ways to resolve issues with their horse which historically would have been addressed using more severe tack and riding/training methods. This is good news for our equine friends who have over the years been misunderstood and, sadly, mistreated – horses have a lot to teach us, not only about them, but about ourselves, and owners/riders who I have worked with have found a wonderful and rewarding way to reconnect with their equine partners, and have formed a magical bond with them. 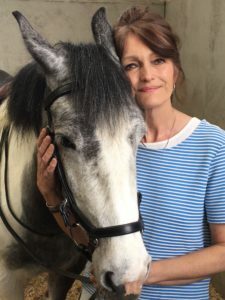 Jill Haxell-Mound is a Reiki Master Teacher & Practitioner, specialising in Reiki treatments for humans, small animals and horses through her business, Caballus Reiki. Jill also provides Reiki training at 1st Degree, 2nd Degree and Reiki Master, as well as educational Reiki workshops, and guest lectures to final year equine students at local universities.